Benjamin Disraeli once told the House of Commons, “a University should be a place of light, of liberty, and of learning.” If he had gone into more detail he might also have mentioned the University halls of residence being a place for virginities to be disappointingly lost and the union bar being a place for the young Conservatives in the rugby 4th XV to drop their trousers whilst gargling the national anthem through a haphazardly downed pint. Well, that’s how it seems to be in the former Poly’s anyway. How it all goes on in the more esteemed seats of learning my relatively modest education does not permit me to tell you, but I can’t imagine its so far removed that’s its all about taking freshers to tea, pipe smoking and sharing quarters with a bloke from Huntington called Cecil (who insists on pronouncing it Sea-sill rather than Seh-cill). So who do these Oxbridge types think they are, with their boat race, their big venue annual showdowns and their Blues, thinking we, the people, might in any way be interested? 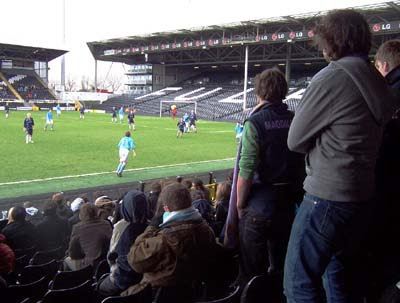 Well, alright I might have turned out at Craven Cottage for this year’s pre-canoes football clash but, to show I wasn’t all that bothered, I only deigned to turn up after half an hour had been played. My own little protest there, my own little fanfare for the common man, and absolutely nothing to do with the fact that it was only after I’d got off the bus at Fulham Broadway that I’d remembered the clocks were supposed to have gone forward the night before. Yeah...well...well...I meant it. Don’t want them fackin’ stoodents finkin’ their special or anyfin’. Tardy of me really though as this was a special occasion; the 125th Varsity football match, the first having taken place at the Oval in 1874. 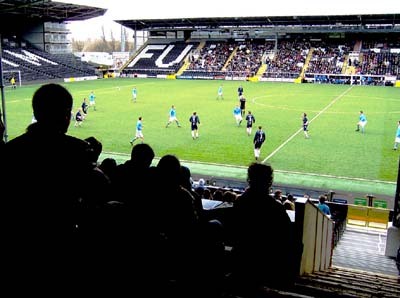 You might imagine Craven Cottage to be quite a prestigious venue for this event but Wembley was its home as recently as 1988 and has been played at most of the major grounds in London not to mention the Crystal Palace and Queen’s Club. 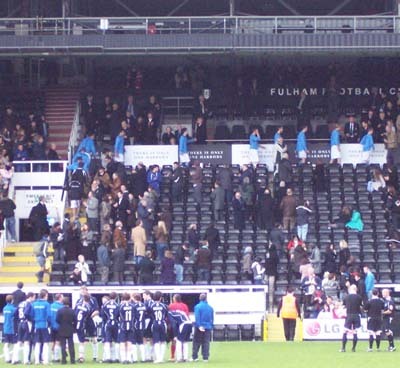 For the occasion I sat in the cheap seats in the Johnny Haynes Stand, the more expensive Riverside Stand seats being joint tickets with access to the terrace out the back so you could watch the boats hammer past later that afternoon. Needless to say the more boisterous elements of the partisan support for either side had also taken this option and I was a freshly creosoted fence of neutrality sat between their vocal mobs goading each other with, more often than not, language that would shame a dockyard welder, let alone Oxbridge’s best and brightest. The intellectual gigantism of the Oxford mob was probably best encapsulated by their goading of Cambridge skipper Jamie Rutt (Trinity College, studying Economics) with a chime of “captain dickhead, dickhead captain.” The Oxford mob never let up their singing, directing a “we love you Howard we do” at referee Howard Webb, on loan from the Premiership for the day as well as an “old man, give us a wave” at a middle aged gentleman walking across the front of their section. 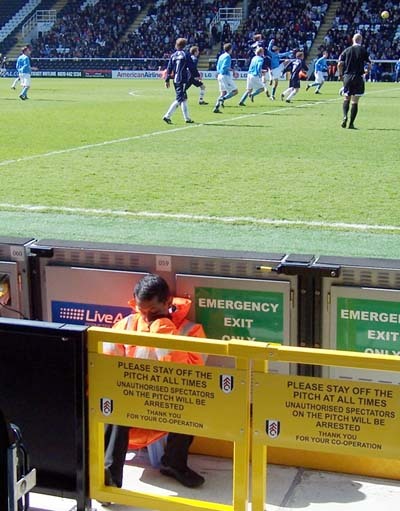 Despite their noise the timid looking steward sat at the front kept nodding off, himself clearly having forgotten to allow for the hour being taken off him by the onset of British Summer Time. Eventually, their braying caused a group of spotty Cambridge types to respond; “can you hear the Cambridge sing” being greeted with an agitated “F*** off Oxford!” Not that all the noises off were so base and universal; “C’mon Oxford, let’s show ‘em why we’ve won fewer Nobel peace prizes” being a rallying cry you could only really get at a game like this. That the players should also be regarded as students like any other was made clear by the programme, a large part of which they had contributed themselves in the form of ‘Meet The Players’ pen pics and ‘season so far’ columns. Reading it I was able to learn that Cambridge’s Matt Amos (Queen’s College, studying Economics) is “your typical England centre-forward: brilliant in the air, a great target-man, loves a pint and is fat.” Elsewhere amongst his teammates, the pictures painted suggest the following; that Ali Hakimi (Darwin College, Natural Sciences) has “minge-like facial hair”, that Mike Stark (Selwyn College, Land Economy) “finds massaging fake tan into his immaculate calves very relaxing” and that Mark Baxter (Selwyn, Medicine) is a Jeffrey Archer fan and a racist. What larks. For the other side “research into [Oxford’s] Toby Hodgson [St Peter’s College, Archaeology and Anthropology] has shown that there is officially a negative correlation between how posh you sound and how good your dress sense is.” I can’t mock too much though as I wrote loads of this in-jokey type stuff when I was ensconced in the Uni of Portsmouth union magazine squad. Yes, that’s right, I was a c*ck back then too – it’s all part of the fun of being one of the great unwashed. Deal with it, oafs. Winky emoticon, winky emoticon, smiley emoticon. I had considered coming to the 124th game last year, having been at one of Cambridge’s warm up games, against the Territorial Army. 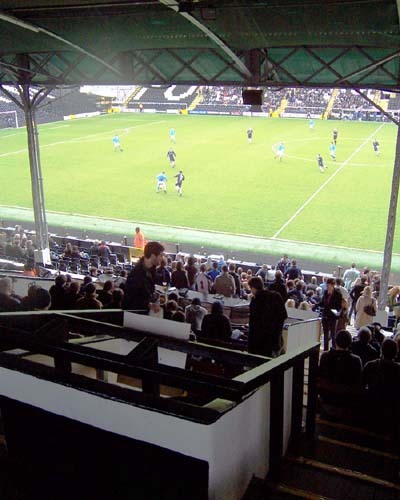 In not doing so I missed an apparently scintillating 5-3 win for the lighter blues of Cambridge. In coming this year I saw a 1-0 Oxford win with the only goal scored, by Sam Hall (Trinity College, Jurisprudence) whilst I was still on the number 11 from Liverpool Street. I can pick ‘em, can’t I? As it goes that goal was Oxford’s 197th in these matches, which means they now mirror Cambridge goal for goal as well as match for match, both sides having now won 49. Although I’m not sure I’ll bother coming back to see one or tuther forge ahead, think I’ll just sleep in properly next year.